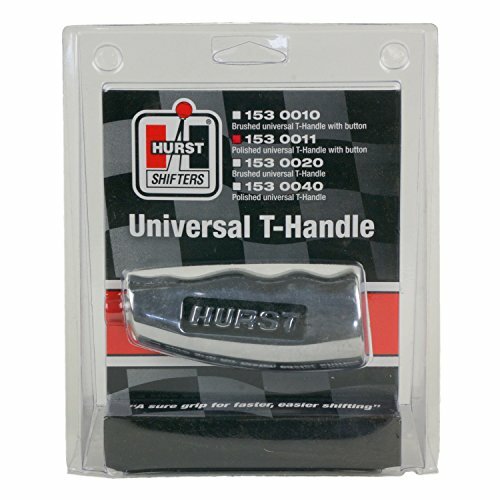 The Hurst universal t-handle with a chrome finish, fits most shifter applications using included threaded inserts included in the kit. SAE 1/4 - 28, 5/16 - 18, 3/8 - 16 and 1/2 - 20. 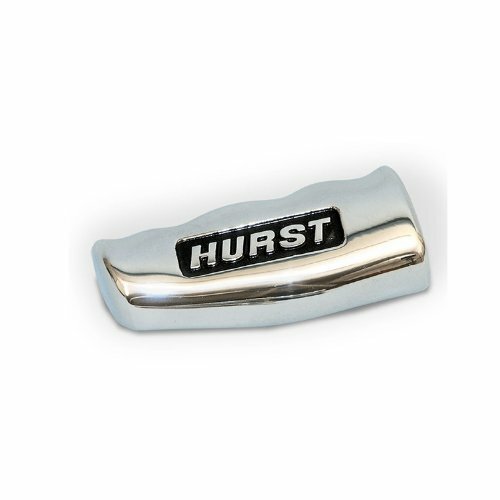 Hurst polished finish t-handle and bold Hurst identification adds a stylish touch to your race shifter. Fits SAE 3/8 and 1/2 in. threads. Also fits 10 mm, 12 mm and 16 mm threads. 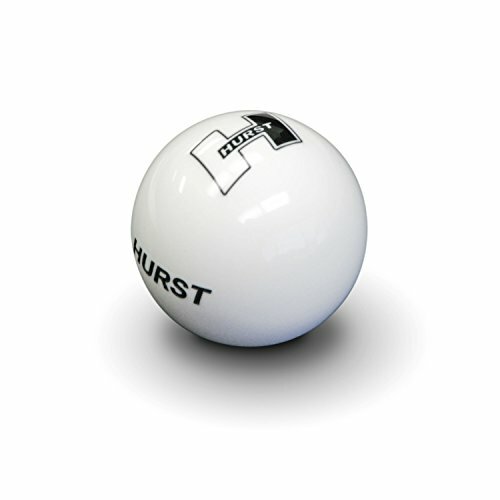 Install our classic Hurst shifter ball, and instantly change the look of your cars interior. Made of high gloss, high strength plastic, with the engraved inlaid shift pattern, molded in brass thread insert complete with the jam nut. A classically styled B&M T-Handle to top-off your shifter stick. It comes with a set of SAE thread inserts to accommodate many aftermarket sticks in vehicles set up for left hand drive, and it features a black plastic finish. Buddy Club short shifters reduce the throw by 40 percent over the stock shifter. By reducing the shift throw, it offers a much faster, precise , and controlled gear shifting motion. As a result, faster acceleration and lower quarter mile time will be achieved. 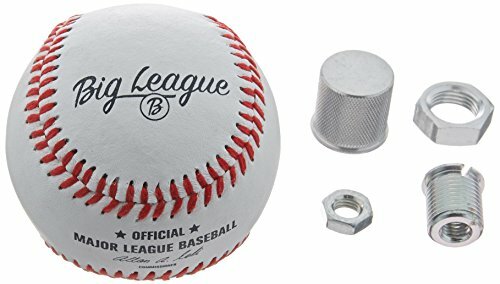 Budget friendly MLB Baseball Gear Shift Knob Manufactured by American Shifter Company using an official size and weight Rawlings practice ball. 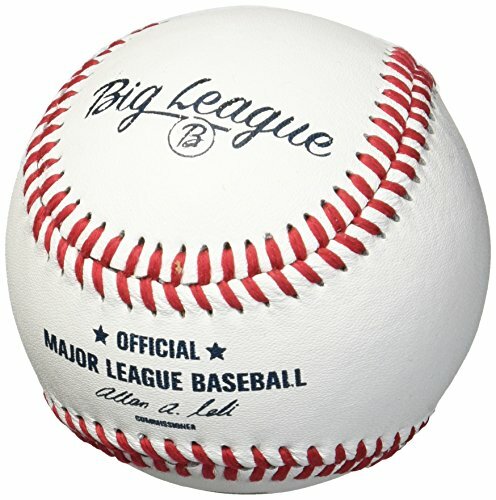 For an official MLB game ball see our knob #ASCSN15001. 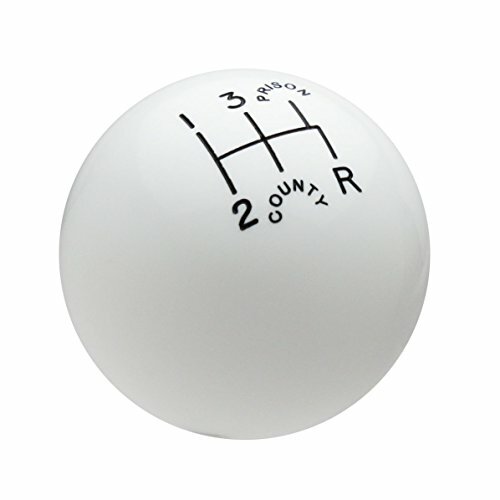 Play Ball, American Shifters official size and weight baseball shift knob is ideal for all car fans. Made from a Rawlings practice baseball this knob is sure to deliver a home run feeling on every shift. 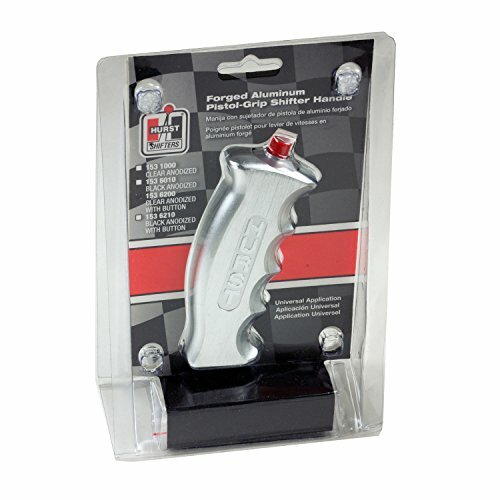 American Shifters shift knobs offers an exclusive aluminum threaded insert designed to be screwed onto your shift arm. You should avoid shift knobs with set screws or plastic parts as they tend to fail or wobble. Aluminum inserts are only found on the high quality shift knobs as they do not rust like standard metal inserts. Each insert is threaded and includes a matching jam nut for easy installation. This insert can be adapted to fit any vehicle on the market with American Shifter s screw-in adapters that are available in several sizes. Use American Shifter s suicide brody knob adapter to convert this shift knob into a brody steering wheel knob and steer with ease. 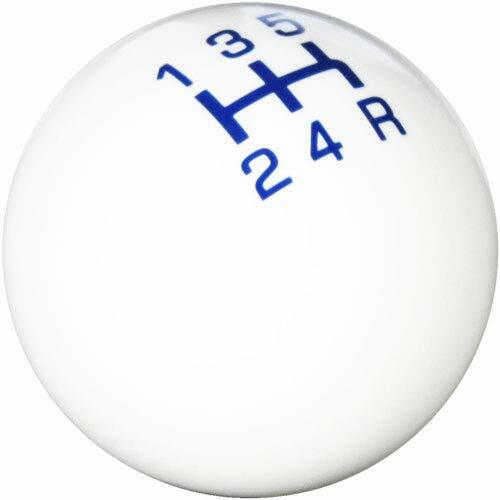 Speed Dawg Traditional Series White 'County Prison' 2-1/8-Inch diameter shift knob with 5 Speed Reverse Lower Right shift pattern. Please note the County Prison text replaces the 4 and 5 speed numerals. This product is comprised of specially formulated high-impact polymer resin specifically designed to meet performance level torque and temperature requirements. This knob has a 16mm x 1.50 Brass master insert and comes with a threaded Brass adapter and jam nut in the size of your choice. Made in the USA. Factory Mustang shifters may require a Boot Retainer to complete the installation. WARNING: Failure to follow the enclosed installation instructions could cause the shift knob to rattle or break. Do NOT overtighten or allow the shift knob to bottom out on the shifter. Always secure the shift knob with one of the enclosed jam nuts as directed by the enclosed installation instructions. 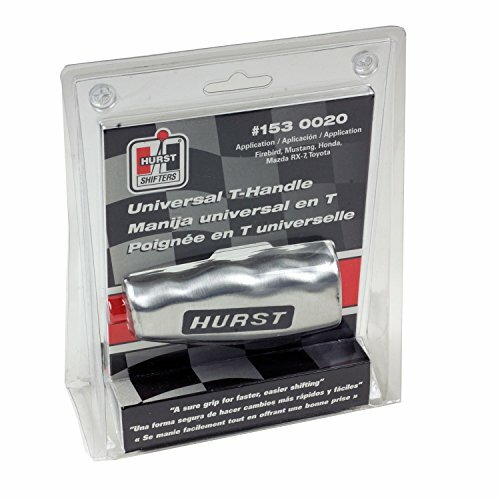 The Hurst universal T-handle with 12 V momentary button, can be used to activate line-lock, nitrous, trans brake or two step. Includes SAE 3/8 - 16, 7/16 - 20, 1/2 - 20 and metric M10-1.25, M10-1.50, M12-1.25, M12-1.75 and M16 - 1.50. The Hurst Pistol Grip Shifter handle with 12 V switch is designed to provide a firm comfortable natural grip, reducing the chances for a missed shift. The momentary 12 V switch can be used to activate line lock, nitrous or trans brake. Black 2-1/8" diameter shift knob with engraved White 5 Speed Reverse Lower Right shift pattern. COUNTY PRISON text replaces the 4 and 5 speed numerals. Comprised of specially formulated high-impact polymer resin specifically designed to meet performance level torque and temperature requirements. This knob has a 16mm x 1.50 Brass master insert and is packaged with 3/8-16 and 3/8-24 brass adapters and jam nuts. Made in the USA. 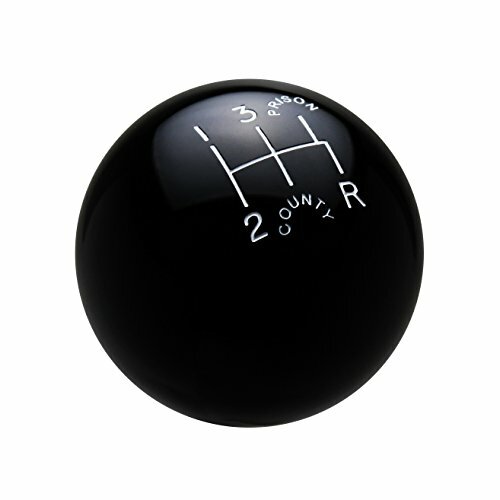 Speed Dawg Traditional Series Black 'County Prison' 2-1/8-Inch diameter shift knob with 6 Speed Reverse Upper Left shift pattern. Please note the County Prison text replaces the 5 and 6 speed numerals. This product is comprised of specially formulated high-impact polymer resin specifically designed to meet performance level torque and temperature requirements. This knob has a 16mm x 1.50 Brass master insert and comes with a threaded Brass adapter and jam nut in the size of your choice. Made in the USA. Factory Mustang shifters may require a Boot Retainer to complete the installation. Speed Dawg produces premium quality gearshift knobs for racing and automotive enthusiasts. Comprised of specially formulated high-impact polymer resin, Speed Dawg knobs are specifically designed to meet performance level torque and temperature requirements. 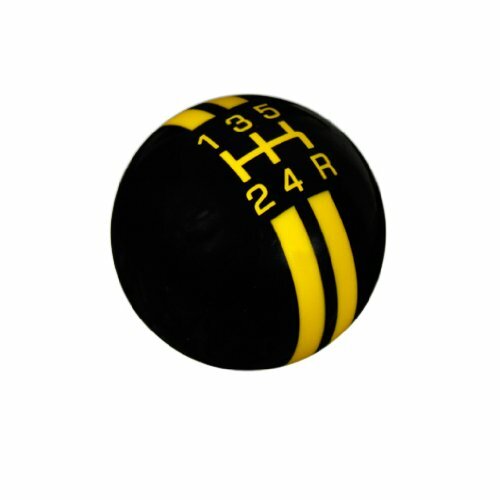 This black shift knob has dual yellow rally stripes and 5-speed shift pattern with reverse down and to the right. The knob has a weight of 3.9 ounces and a diameter of 2-1/8 inch. Speed Dawg actively sponsors numerous racing teams and racing series across the United States and Speed Dawg shift knobs are used by numerous professional car builders and race teams. The Type A shift Knob can be used with floor mounted shifters such as the Altezza, Chaser, and DC5. 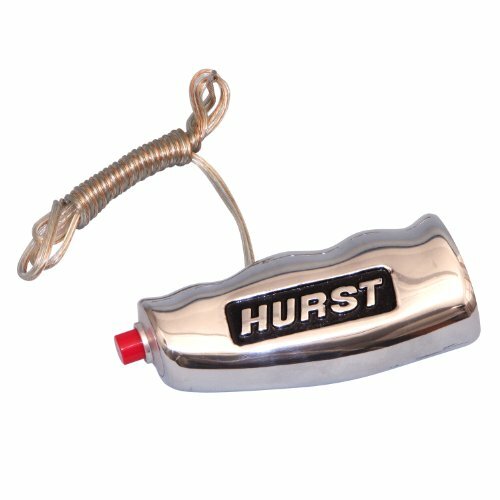 Hurst polished t-handle with button and 12 Volt switch allows you to control a Roll Control, nitrous or other accessory directly from your shifter handle. Polished aluminum finish and bold Hurst identification adds a stylish touch to your race shifter. Fits SAE 3/8, 7/16, and 1/2 in. threads. Also fits metric 10, 12, and 16 mm threads. 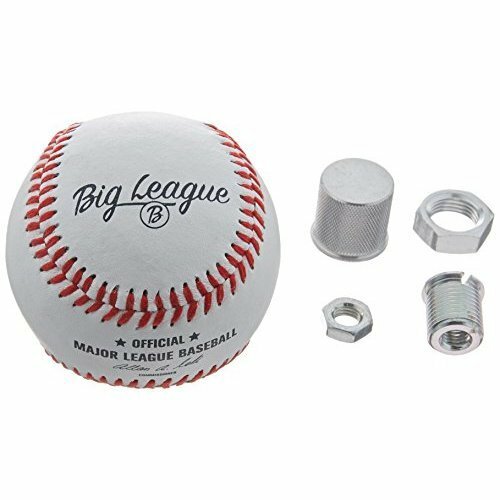 Budget friendly MLB Baseball Gear Shift Knob Manufactured by American Shifter Company using an official size and weight Rawlings practice ball. 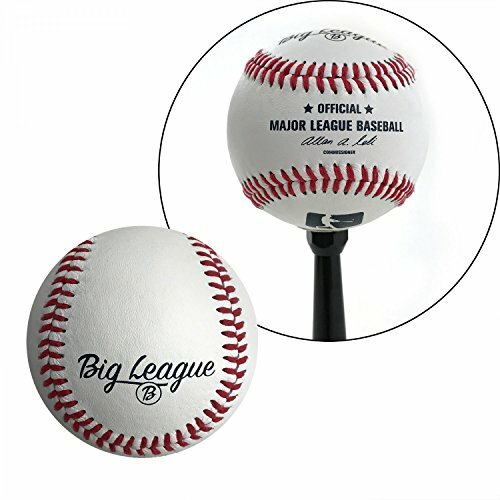 For an official MLB game ball see our knob #ASCSN15001. Play Ball! American Shifters official size & weight baseball shift knob is ideal for all car fans. Made from a Rawlings practice baseball this knob is sure to deliver a home run feeling on every shift. American Shifters shift knobs offers an exclusive aluminum threaded insert designed to be screwed onto your shift arm. You should avoid shift knobs with set screws or plastic parts as they tend to fail or wobble. Aluminum inserts are only found on the high quality shift knobs as they do not rust like standard metal inserts. Each insert is threaded and includes a matching jam nut for easy installation. 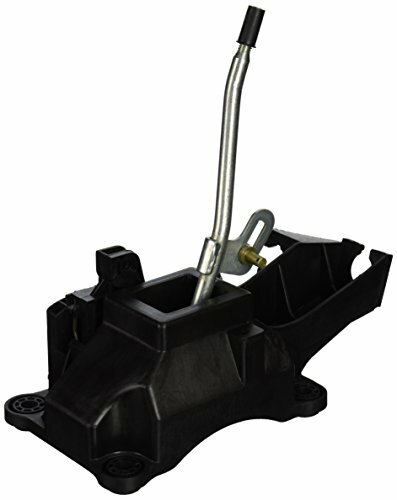 This insert can be adapted to fit any vehicle on the market with American Shifter's screw-in adapters that are available in several sizes. Use American Shifter's suicide brody knob adapter to convert this shift knob into a brody steering wheel knob and steer with ease. 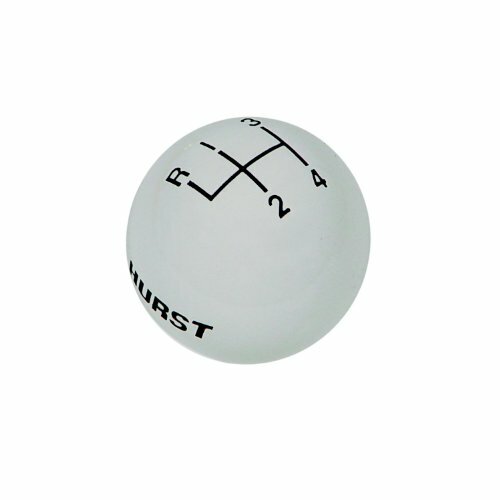 Universal Hurst shift knob ball, white glossy finish with Hurst H logo on the top of the ball. 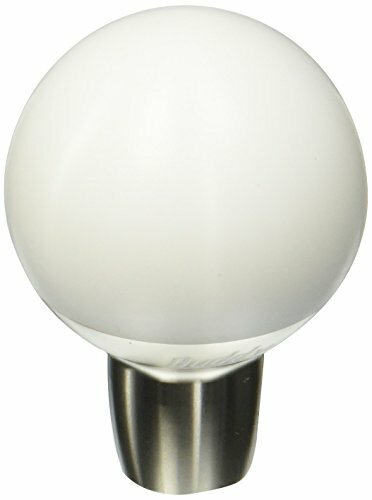 Elegant and classic, this ball shaped shift knob will instantly add a splash of style to any vehicle interior with common thread size on the shift stick. Speed Dawg Pro Series shift knobs are 2-1/8 inch diameter and have a weight of 4 ounces. They are comprised of specially formulated high-impact polymer resin that is specifically designed to meet performance level torque and temperature requirements. Speed Dawg Pro Series shift knobs feature smooth surface inlaid shift patterns that will not wear off.